Traffic rules are the most important rule everyone should follow, as breaking it means huge consequences. If we look at the number of people losing their lives in road accidents, it is the high time people should start following traffic rules. The traffic police of all the states are trying their best to make people aware of the traffic rules and how important it is for them. Some of them are even trying new and innovative things to spread awareness. They are also using social media for the same purpose. However, people are still breaking the basic rules like wearing helmets or wearing seat belts. Delhi Police has come up with a rather amazing campaign to educate people about the traffic rules. They are showing mirrors to the people, who break the traffic rules. 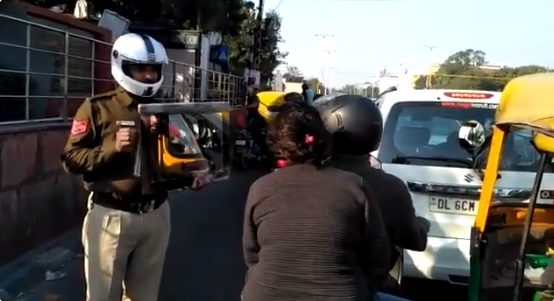 The official Twitter handle of Delhi Police tweeted a video, which shows Police wearing a helmet showing a mirror to those who are not following the traffic rules. Not only mirrors but they are also showing placards with messages about road safety. Police are looking to encourage people to wear helmets with their latest campaign. People are loving Delhi Police’s new campaign calling it innovative and unique. Look at some of the tweets down below. Minding the traffic at peak hours is definitely not easy. We have to learn to obey the rules. No traffic officer would let us play with our lives. Respect the police. Obey the laws. Great attempt in changing people's perspective about Police. The efforts of the Delhi Police deserve to be applauded. People should also really follow the traffic rules for their safety as well as others.